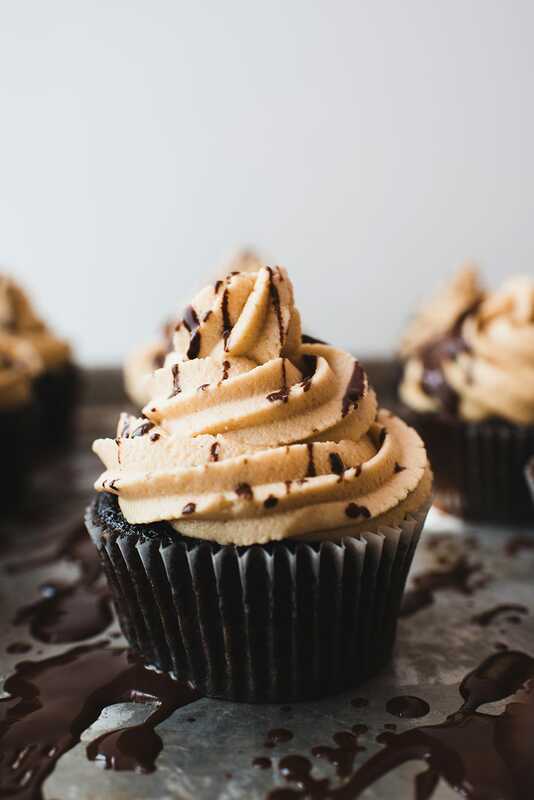 These Chocolate Peanut Butter Cupcakes are drizzled with dark chocolate and topped with a peanut butter frosting. They’re perfect for when you’re in the mood for a decadent treat. If you’ve been following Let’s Eat Cake, you know that we’re huge fans of the classic combination. We’ve made Chocolate Peanut Butter Fat Bombs and Chocolate Peanut Butter Overnight Oats before, but I thought it was about time we made something truly sweet! There are a few things in this world that I simply can’t resist. Cotton candy, stopping to stare at the stars on clear nights, and the combination of chocolate and peanut butter. What I also love about this recipe is that it’s so easy. The chocolate cupcake base just uses three bowls and you won’t need the electric mixer for the cake portion. 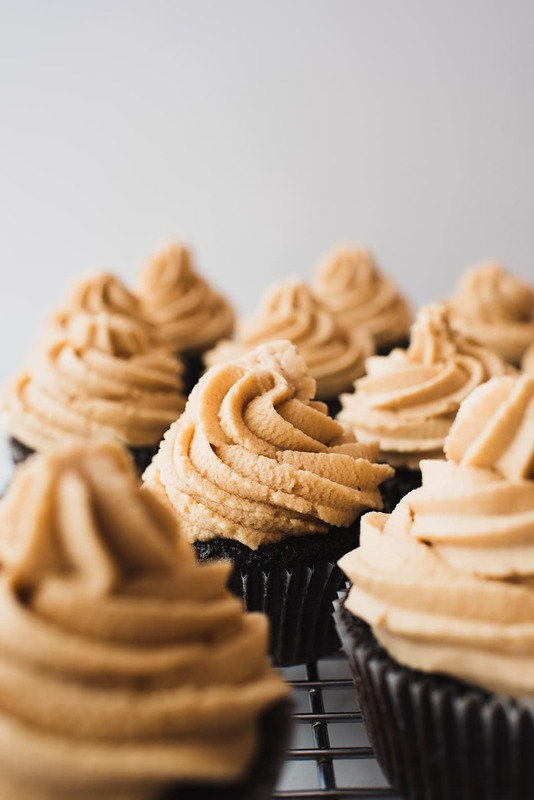 And, the peanut butter frosting has that super rich peanut butter flavor because it combines peanut butter with heavy cream, vanilla, powdered sugar, and a dash of salt. I did mention these were decadent, right? What Type of Chocolate Is Best? To make these cupcakes, I first created a rich chocolate cake base using Dutched cocoa and Private Selection 62% chocolate. You can use any % of chocolate you want (including milk chocolate), but I prefer to choose a chocolate chip or chunk that has a higher cacao percentage. Since I’m already adding sugar to the recipe, I believe this helps the chocolate flavor stay front and center. I’m a big fan of Private Selection chocolate – it’s always available at Ralphs, part of the Kroger Family of Stores, at a reasonable price and it tastes like the pricier Belgian chocolate chips that I have to special order. Quality and convenience makes it a win-win for me. What Type of Cocoa Powder Should I Use? No matter what chocolate chip percentage you choose, it’s imperative that you use Dutched cocoa powder. When you’re at the store (or hunting around in your pantry), look for cocoa powder that says Dutch-processed or processed with alkali. This is critical. Without it, your cupcakes will sink and be sad and you’ll be mad at me. It happened to me. On repeat. I wasn’t paying attention and couldn’t figure out why my cupcake recipe was not working! Batch after batch of chocolate cupcakes rose in the oven and sank in the middle. Turns out it was the cocoa I had been using. I didn’t realize when I had changed cocoa powders that I had started using a non-alkalized cocoa. This is the cocoa powder I used for this recipe. It combines both types, is great if you can’t find cocoa that’s entirely Dutch processed, and results in a darker, fudgier chocolate cupcake. Which just happens to go perfectly with peanut butter frosting. 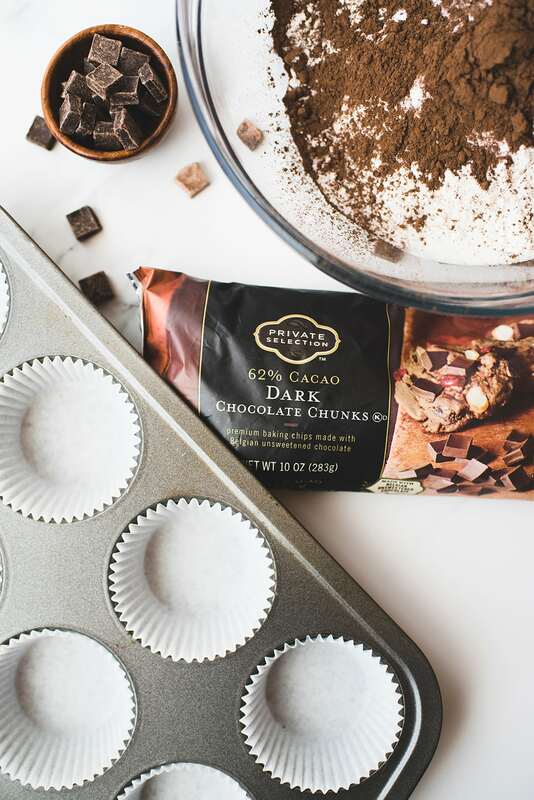 Here are a couple quick tips on how to make these the best chocolate cupcakes ever! You all know how much I love my stand mixer, but you don’t actually need it for the chocolate cupcake base! Instead, you’ll need just three bowls: two medium or large bowls (one for dry and one for wet), and one small bowl (to mix together the chocolate and boiling water). Use Dutched cocoa powder or one that combines Dutched and non-Dutched. I don’t want your cupcakes to sink! For pretty piping, use a 1M Wilton tip or an 825 Ateco open star tip. I used the latter for these cupcakes. To apply the drizzle without making a giant mess, place the cupcakes on a baking sheet and wave a chocolate-filled spoon over the top. Bake your cupcakes until they bounce back just slightly when touched or when a toothpick inserted into the center comes out clean. 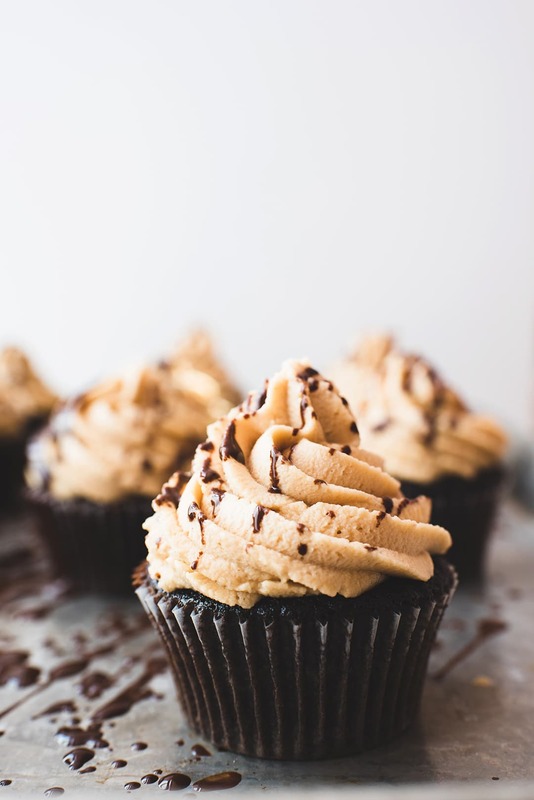 These chocolate peanut butter cupcakes have a rich, fudgy chocolate cake and are topped with a creamy peanut butter frosting. Preheat oven to 350° F. Line muffin tin with 12 cupcake liners. Place sugar, flour, baking soda, salt, and cocoa powder in small bowl. Stir until combined. Set aside. Whisk egg, buttermilk, vanilla, vinegar, and oil together in medium bowl. Set aside. Place chocolate chips in small bowl. Bring one cup of water to boil and pour 3 fl. oz. over chocolate chips. Stir to combine. 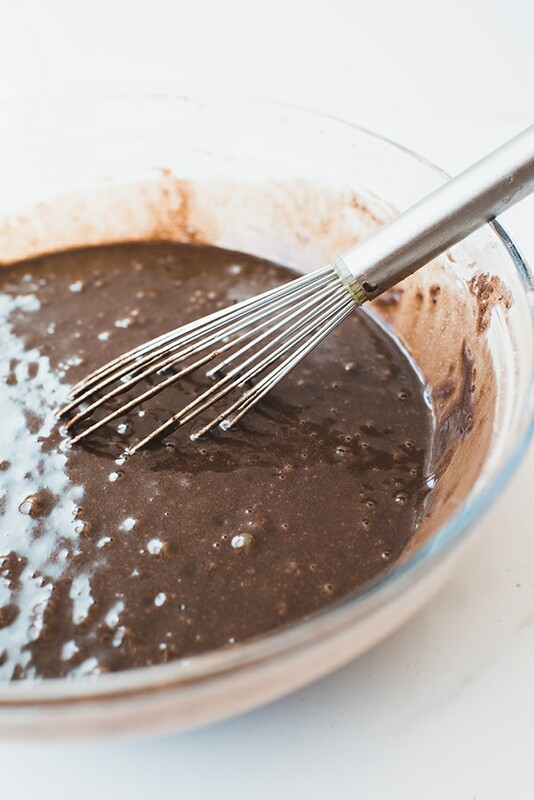 Pour into egg mixture and whisk until combined. Fill muffin cups using ¼ cup measuring cup. Bake for 20-24 minutes or until tops bounce back slightly. Place butter and peanut butter in bowl of stand mixer and combine on medium high speed for 1 minute. Add confectioner’s sugar. Cover and combine on medium high speed until mixture is even consistency. Add vanilla extract, heavy cream, and salt. Combine on medium high until mixture is even consistency. For the drizzle, combine ½ cup chocolate chips or chunks and 1 Tbsp. coconut oil. Heat in microwave for up to 2 minutes at 50% power stirring every 30 seconds until melted. Place cupcakes on baking tray and drizzle melted chocolate by waving spoon above cupcake. 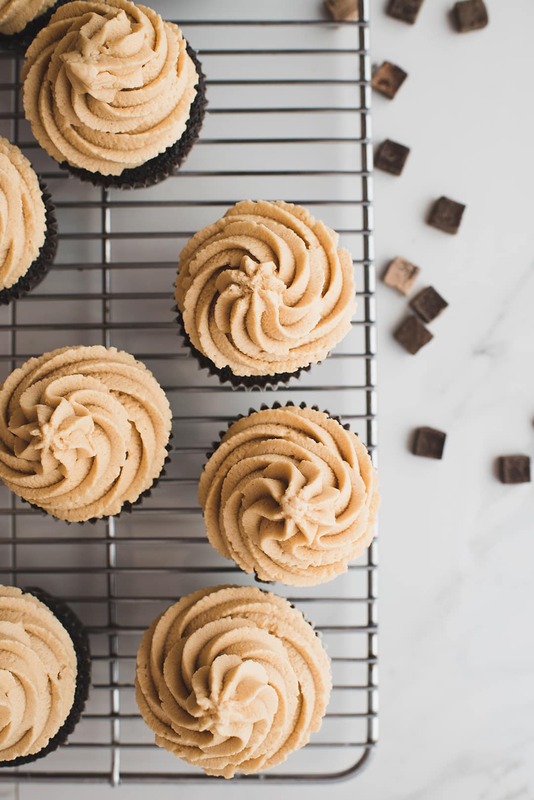 To achieve the amount of peanut butter frosting seen in the photos, double the frosting recipe. These cupcakes sound perfect, with that wonderful combination of chocolate and peanut butter. Such a good tip to use the right kind of chocolate/ cocoa powder. No one likes a sunken cupcake, it is a most disappointing result. You’re welcome! It kept happening to me and I would feel bad if someone used “regular” cocoa powder and their cupcakes didn’t work out. That. Frosting! So beautiful! 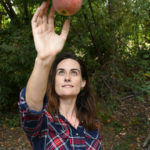 This post made me crave peanut butter to the extent that I ran downstairs and dipped some dark chocolate into the jar as a little snack, I kid you not! This is going on my must-try list. These are some gorgeous but fun looking cupcakes. I’ve never had the urge to make a cupcake recipe from the web but yours look so unique and delicious! I just gotta try it. I think my toddler would agree that we need to make them! Fyi, the cocoa powder that you used “link” is broken. Thanks for sharing your recipe. Oh my gosh, these cupcakes are wicked adorable. I love chocolate and peanut butter together. Well, these have got to be my favorite cupcakes in the whole world. Great baking and combination of ingredients. These look so delicious! 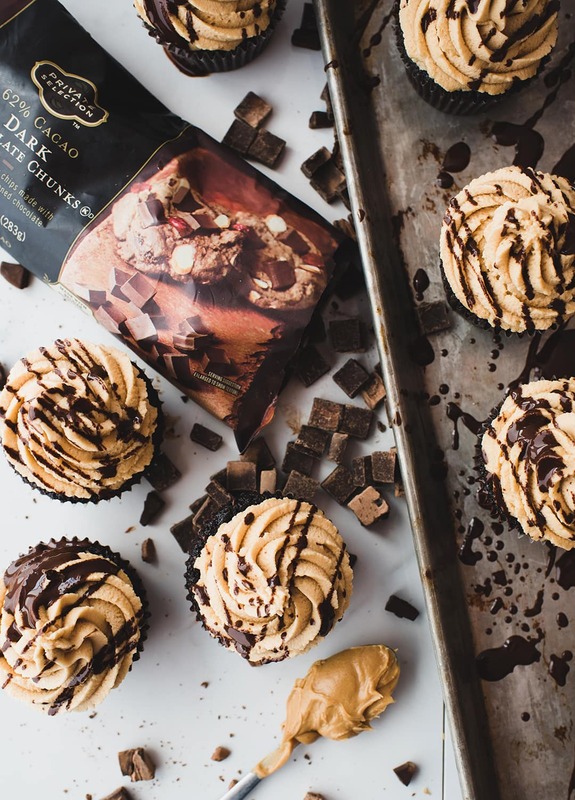 Nothing beats the PB+chocolate combo. I’m definitely going to have to try this recipe!